This is a busy month for stopping plants for shows in June, at the same time I remove any big leaves from Dwarf and Miniatures. As the weather has warmed up during the day, I have changed the balanced feed (Chempak No 3) to 3/4 strength. The reason for this is that I have to water the plants more often. 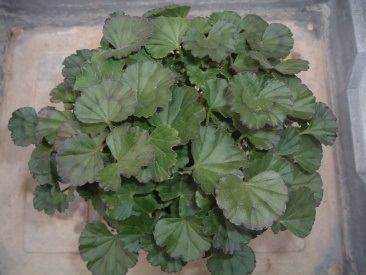 The photo is a plant of Solo that I knocked off the staging while opening the windows,"Oh dear I said" as it got caught up in my coat. As you can see I was lucky just one branch broke off. I have used stakes to pull branches in to fill the gap left after the fall. In a few weeks I will pull them in a bit more, and hopefully the plant will grow to keep its shape. At last the weather has warmed up with frost free nights. All the show plants have been stopped, and with the recent sun have really taken off. I had to move my Gold Leaf plants, as the sun started to bleach the leaves. Also moved some Dwarfs and Stellars with a dark zone, as the leaves have started to go red in the sudden change in temperature. The start of this month has been a lot milder, with some sunshine during the day. As I have had to water a lot more, the feed has been changed to half strength. 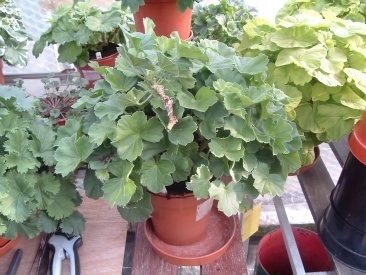 Epsom Salts have been added to help improve the colour of the foliage. The weather has warmed up a bit too much for my liking for the time of year. In trying to keep the temperature down in the greenhouses, I have removed the bubbles and painted white shading on the glass. On plants that have a dark zone, like Clatterbridge & Birdbush Chloe, the leaves will soon go red in the sudden rise in temperature. When this happens it is best to remove them as they will only get worse, and new ones will come in their place by 'Show Day'. Not had much of a chance to get on here this month, been so busy watering, making up baskets and sorting the Hosta collection. As I feed every time I water, this has been changed to quarter strength Chempak No 3 for now. Due to all the sun of late, plants are well forward, so I may not use high potash feed. With Dwarf, Miniatures, and Stellars I remove any early flower stems up to 6 weeks before a show. More will be back in time for the big day. It is a good idea to check the height of Miniature - 5" and Dwarf - 7", this is from the top of the pot. Sometimes one may get a stem that is growing too strongly, now is the time to deal with it. 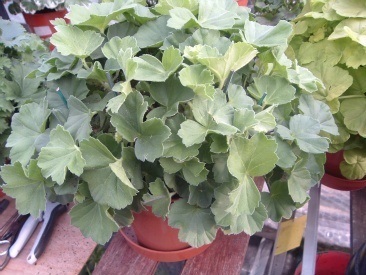 Cut it back under the leaves, and the plant will grow to fill the gap and look something like the plant below. 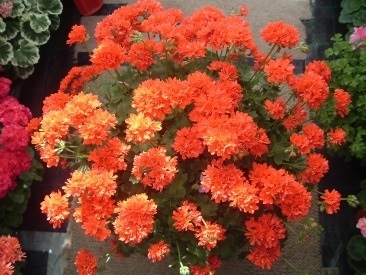 June already, been so busy in the greenhouses and garden did not know it had arrived - LOL. The weather is being a nightmare, so cold at the end of May and carried on into this month, then on 3rd it went up by 10 degs, C in the sun. My plants are way behind, plenty of buds that will not open, and only a week to first show at the Essex Society in Southend. Yes, I am in panic mode, resorting to using high potash (Chempack No 4) at half strength in the hope of hurrying things along. 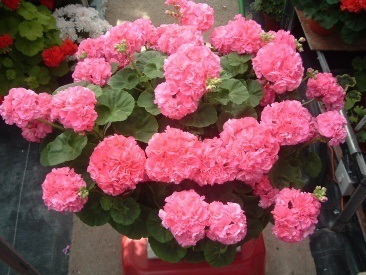 This has to be the worst growing season, since I first started showing Pelargoniums. Never known so may yellow leaves, guess this was mainly due to the constant changes in the temperature. Regals were very poor, Angels as well. Mine got drawn up by poor light levels this month, not helped by the shading put on when it was so hot at the beginning of May. The plants have been cut back, ready to start the growing cycle for 2011. Fingers crossed for a better year ahead, at least I did manage to get some decent plants on to the show bench. STELLAR BIRDBUSH CHLOE, WHICH GOT ME BEST IN SHOW AT THE YORKSHIRE SOCIETY. CARLTON SUPREME A SEEDLING WHICH WON THE BASIC ZONAL CLASS IN YORKSHIRE.